Students take the wheel in this exciting simulation! 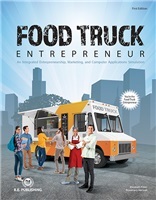 Food Truck Entrepreneur places students in the driver’s seat as they use their creativity, entrepreneurial spirit, and computer applications skills to start and run their own food truck business. Guided by Anton D’Amico, owner of the successful Boston-based food truck The Lobstah Trap, students are challenged to turn a unique idea into their own mobile business. Using word processing, spreadsheets, desktop publishing, and presentations applications, students work to produce a range of professional documents they’ll need to make their start-up thrive. From creating a mouth-watering menu to designing a mobile app, students will be totally engaged as they learn first-hand how computer applications can be used to run a successful business. The Online Instructor and Student Resources for Food Truck Entrepreneur are required and include Project Planning Forms, Student Sample Documents, and Grading Rubrics. Project Planning Forms provide a framework for students to begin "mapping out" a project's content, design, and layout on paper first. Student Sample Documents offer inspiration to students and can be used as a guide for grading student work. Project Planning Forms allow students to "map out" a project's content, design, and layout on paper first. Guiding questions help students brainstorm aspects of a project, while design areas allow them to begin sketching the project before designing on a computer. Sample food truck owner Anton D'Amico's documents accompany each project and are designed to provide students with inspiration and guidance as they complete projects tailored to their own food truck. The Student Sample Documents can also be used as a guide for assessing student work.